Franche-Comté ([fʁɑ̃ʃ kɔ̃te]; literally "Free County", Frainc-Comtou dialect: Fraintche-Comtè; Arpitan: Franche-Comtât; German: Freigrafschaft) is a former administrative region and a traditional province of eastern France. Since 1 January 2016, it is part of the new region Bourgogne-Franche-Comté. 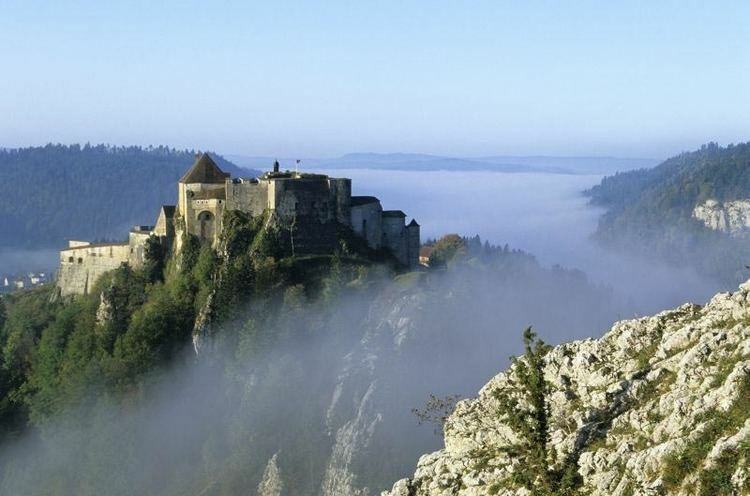 It is composed of the modern departments of Doubs, Jura, Haute-Saône and the Territoire de Belfort. In 2009, its population was 1,168,208. The region is named after the Franche Comté de Bourgogne (Free County of Burgundy), definitively separated from the region of Burgundy proper in the fifteenth century. In 2016, these two halves of the historic Kingdom of Burgundy were reunited, as the region of Bourgogne-Franche-Comté. The name "Franche-Comté" is feminine because the word "comté" in the past was generally feminine, although today it is masculine. The principal cities are the capital Besançon, Belfort and Montbéliard (the last two form the aire urbaine Belfort-Montbéliard-Héricourt-Delle). Other important cities are Dole (the capital before the region was conquered by Louis XIV in the late seventeenh century), Vesoul (capital of Haute-Saône), Arbois (the "wine capital" of the Jura), and Lons-le-Saunier (the capital of Jura). The name Franche Comté de Bourgogne (Free County of Burgundy) did not appear officially until 1366. It had been a territory of the County of Burgundy from 888, the province becoming subject to the Holy Roman Empire in 1034. It was definitively separated from the neighboring Duchy of Burgundy upon the latter's incorporation into the Kingdom of France in 1477. That year at the Battle of Nancy during the Burgundian Wars, the last duke, Charles the Bold, was killed in battle. Although the County, along with the Duchy, was seized by King Louis XI of France, in 1492 his son Charles VIII ceded it to Philip of Austria, the grandson and heir of Charles the Bold. When Philip's son, Emperor Charles V, inherited the Spanish throne in 1516, Franche-Comté, along with the rest of the Burgundian lands, passed to the Spanish. Franche-Comté was captured by France in 1668, but returned to Spain under the Treaty of Aix-la-Chapelle. It was conquered a second time in 1674, and finally was ceded to France in the Treaty of Nijmegen (1678). Enclaves such as Montbéliard remained outside French control. Franche-Comté was one of the last parts of France to have serfdom. In 1784, half of the population consisted of serfs, accounting for 400,000 out of the 1 million French serfs. Landowners took one-twelfth of the sales price if a serf (mainmortable) wanted to sell up. Serfs were not forced to stay on the land, but the lord could claim droit de suite, whereby a peasant who died away from his holding left it to the lord, even if he had heirs. A runaway serf's land was forfeit after ten years. Louis XVI issued a decree banning these practices on 8 August 1779, but the Parlement of Besançon blocked this until 1787.